Taxes are due quarterly; February 1st, May 1st, August 1st and November 1st with a 10 day grace period. 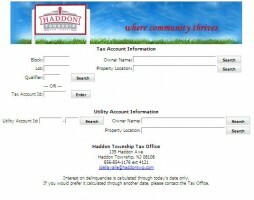 If you would like a tax reminder, please fill in the form below. Email Marketing Software by VerticalResponse. Permits and forms in conjunction with the Municipal Clerk’s Office. The Office of Vital Statistics is responsible for issuing birth certificates, death certificates, marriage licenses, civil unions, and domestic partnership licenses. Contacts—Please dial (856) 854-1176 and the ext. number listed below.